I have this fuzzy memory from my childhood of banana chips. I was probably around 5 years old. I was the baby of the family so I got to spend a lot of time alone with my mom. I went to half day kindergarten ( I wish they still had that!) This meant that I got to eat lunch with my mom. I remember going to the salad bar at the grocery store. We would build an amazing salad. Then we would grab a bag of banana chips and head home. We would eat our lunch while watching Sesame Street. I was a little obsessed with Big Bird. I still remember the sweet crunch of those banana chips! I’m not a big banana fan. I think it’s a texture thing. I like bananas in breads, smoothies and I like banana chips! I just can’t stand to eat a banana on its own. These Homemade Banana Chips are amazingly simple to make. I found that they don’t end up being quite as crispy crunchy as store bought but still pack a crunch. The bananas need to be sliced at 1/8 inch or thinner. I sprinkle mine with a little cinnamon for a little added sweetness. Smear a little peanut butter between two slices for a fun little snack! The best bananas to use for this recipe are ones that are ripe with a few spots on them. You don’t want the ones that are still greenish and you don’t want the ones that are brown. Right in between there is the sweet spot! 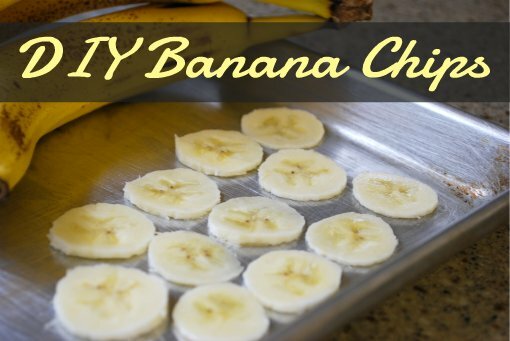 These banana chips are healthy, inexpensive and all around a great snack! Brush with lemon juice mixed with the water, sprinkle with cinnamon and salt. Bake at 250 degrees for about 2 hours, turn after 90 mins. Let cool completely.